One of my favorite parts of story time with my kids is the educational aspect, but I’m not talking about learning new vocabulary or facts. I’m talking about how books have the power to expose your children to the entire world - all of the beautifully diverse people to meet and experiences to be had. Story time gradually expands their appreciation for the limitless beauty to be found in life book by book. The more books we read, the more characters we meet, and the more characters we fall in love with. We step inside their lives and we feel their emotions. Sometimes they’re just like us, but quite often their lives are entirely different. This is the most important kind of education there is. It’s the exact opposite of why someone would be called “small-minded”, and, as an added bonus, the perfect vaccine for bigotry. Even if it’s just knowing that other people feel like you feel, mirrors can be vitally important. We know that children need love and affirmation, and we have to let them know that being true to themselves is crucial. Other stories might be more like looking through windows. It’s these windows that are world expanding - providing valuable education and growth. These are the stories that allow us the opportunity to experience something entirely new - perhaps peek inside another culture or visit a family that’s built entirely different than ours. In some ways it’s similar to the fact that reading will improve your children’s vocabulary. During a normal day, my wife and I simply couldn’t possibly use all of the diverse, wide range of words we read out loud at story time. It’s really exactly the same situation with the wide range of experiences we gain during story time that build our emotional vocabulary. The story is framed by a day at school where students are talking about their families and sharing with the class what makes their family special. But one little girl in the back of the room is nervous and embarrassed because her family isn’t like everybody else’s. So she plans to go last, and she sits back to listen to her classmates talk about their families. 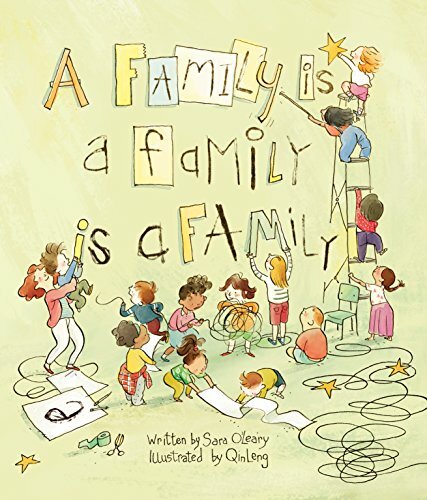 And, holy smokes, you’re in for it now, because the rapid-fire snippets of family life delivered by the classmates - coupled with the beautiful illustrations of Qin Leng - are some of the most heartwarming things I’ve ever experienced. O'Leary took great care in providing as many mirrors as possible - families with two fathers or two mothers, foster families, separated parents, and many more. It’s so seamless and natural and beautiful and straight from the mouth of children. My heart fills up imagining kids finding themselves inside this book. In the end, what makes A Family is a Family is a Family so powerful and effective is how straightforward it is. These are straightforward, beautiful snapshots of families that love each other. From my perspective, I can’t help but imagine the celebration of diversity, but from the perspective of my children, the families just are. My son may not have even known what a foster family was before reading this book, but he does now. It’s just another type of family. And there isn’t even the tiniest inkling in his head that different could possibly mean bad or broken, and that’s a beautiful thing. Happy Thanksgiving to your family from ours. Go celebrate your love and what makes your family unique. Let us know your thoughts on this wonderful book in the comments.